Meet the zany, spunky, passionate crew responsible for turning a vintage trailer into On The Move Art Studio! Brief bio: Kathy teaches art classes through her Kentucky Green Studio located in Paris, KY. In addition, she makes and sells natural candles and body care products under the Kentucky Green/Soapwerks label. Why I am involved: I love to unleash creativity in children's lives. My one wish for the kids we serve: I wish for our students to live a creative, fulfilling life. Brief bio: Raised by a single mother in the projects, Josh fought hard to overcome the adversities of poverty, a broken family, and other tragedies and earned his Master's Degree in Social Work from the University of Kentucky while competing for five years on the UK Track and Field and Cross Country teams. Why I am involved: My dream was to start a nonprofit that could help kids work through issues they are dealing with and avoid the negative influences that come with poverty, broken families, and instability by utilizing art. My one wish for the kids we serve: My wish is that they are able to avoid the negative influences surrounding them and overcome the adversities they are facing. Brief bio: Christian Motley is a Berea College graduate and an education advocate based in Lexington, Kentucky. He previously served as the Deputy Executive Director of the Kentucky Governor’s Office of Early Childhood, and was a presidential appointee in the Office of the Deputy Secretary at the U.S. Department of Education, in Washington, D.C.
Why I am involved: All students should have access to arts enrichment programs that inspire their natural curiosity, and offers a unique path to access skills for self direction, critical thinking and creativity. My one wish for the kids we serve: My wish is for our organization is that we provide spaces where discovery happens, and that our kids unlock their incredible potential in ways that are revealed in other areas of their lives. Brief bio: Judy graduated from the University of Kentucky with a bachelor’s degrees in Accounting and Finance. She currently works at Blue & Co., in Lexington on the audit team. In her spare time she enjoys hanging out with her family and friends, binge watching Netflix, reading and working out. My one wish for the kids we serve: I hope that they remember there is light in the world. Brief bio: Casey Harris grew up in a rural region in Franklin County. She attended the University of Kentucky and graduated with a degree in Media Arts and Studies and minored in Art Studio. Casey has always had a passion for creating and helping others. Why I am are involved: With my job at KET I’m constantly helping tell the stories of great individuals who have made a difference in their community. I decided that I wanted start being someone who was also making a greater difference. 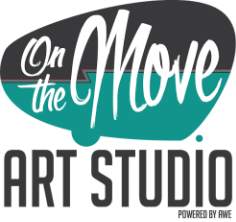 I joined On The Move Art Studio because it was a perfect way for me to combine my love for creativity and helping others. My one wish for the kids we serve: My wish is that they are able to reach their full potential. Brief bio: Olivia Burkett is a Kentucky State University graduate and UK graduate student. She volunteers with several non-profits in the Lexington community, and serves on two non-profit boards; including On The Move Art Studio. Olivia has a passion for people, and so, she is also a Manager at Kroger. When she's not volunteering and serving the community, Olivia enjoys being creative and inspiring others. She's currently working on a podcast that revolves around culture and community. Why I am are involved: I'm involved because it is my passion to serve those in my community, particularly the youth. I was once that kid who had all the energy and creativity (I still am) in the world to make things happen, to create and to inspire. I'm involved because I want to create the space and opportunity for kids to realize their potential and express themselves through art. My one wish for the kids we serve: My hope for our kids is that they never stop creating; that the staff, volunteers and the overall experience of On The Move unlocks and drives each kid's creative power. Brief bio: Chance was born and raised in Lexington, KY and is the oldest of 11 between her mom and dad. She is the founder of The Beasts of the Arts Foundation which was established because of her and her siblings passion for the arts. Because of her heart to help others, she am honored to serve on several diverse nonprofit boards. She enjoys spending time with her family, working with children and eating pasta! She looks forward to the day when she can leave her 8 to 5 and spend the rest of her days serving our communities through the arts; soon. Her life’s goal and personal mission statement is simply, “To help people,” and that’s exactly what she will do. Why I am involved: She loves working with kids. They're so honest and vulnerable. Teaching them that there are positive outlets, especially in the arts, is a lot more than she was taught as a kid. But I was always intrigued by some form of art whether it be music or attempting to draw. And the arts are her heart and passion. My one wish for the kids we serve: I hope that they learn to love and to serve others with a pure heart. Brief bio: Born in Las Vegas, New Mexico lived in Texas for awhile. Had a 30 year career with the YMCA of Central Kentucky. My background is in education with a degree from the University of Kentucky. Married to Mike for 28 years and am a mother of 2 boys Travis and Austin. Have a dog named Petey. Why I am involved: Love working in the community with families and children. My one wish for the kids we serve: That every child has a chance to reach their full potential. Brief bio: Jonah Brown is an attorney and a marketing specialist with a background in serving non-profits. Jonah understands nonprofit markets and the value of marketing but is driven by opportunities to use his creativity to explore new ways to do business. Outside of work, Jonah enjoys traveling with his wife Chioma, and playing with their dog Polo. Why you are involved: I am committed to supporting innovative initiatives that allow kids to experience the arts as a form of expression, as a form of therapy, as a talent and a passion that can be developed and nurtured for years to come. Your one wish for the kids we serve: My hope is that through the experience with On The Move, that every child will be sparked by the desire to explore their creative side, that they will discover a new love for creative expression, or uncover a hidden talent for visual artists, and would develop the self-confidence to truly be who they were created to be. Why you are involved: I got involved with On the Move Art Studio because I was inspired by the work the group was doing for kids in our community. I know the importance of having a creative outlet and it's wonderful to see what magic can happen when kids have the chance to express themselves through art. Your one wish for the kids we serve: My dream for the kids we serve is that they are able to see their own unique talents and that they grow up loving who they are. Brief bio: I'm a Lexington native with a Bachelor's in Fine Art from Columbus College of Art & Design. I'm a chalkboard artist around town (Shamrock & Ethereal Brewing). Also, I am an instructor at Pinot's Palette-Fayette Mall. I have worked with kids of all ages for over a decade. Why you are involved: I wanted to make an impact on my city. To show kids that there is a way to change your situation. I wanted to empower the next generations to dream big and work hard to achieve it. Your one wish for the kids we serve: To realize there is so much more they can do. Brief bio: James Wang is a graduate of the University of Kentucky and an accountant in the Central KY region. He grew up in the city of Lexington and enjoys being involved in his community. Why you are involved: Art is a great way for kids to express themselves; it is also something that should be available to all. On The Move does a great job of bringing opportunities for creativity and expression to underserved neighborhoods and children. Your one wish for the kids we serve: My wish is for the kids to explore their creative side. Brief bio: Meredith Coffey is an Art History/Art Studio double major at the University of Kentucky. She is mainly focused in fiber and textile art. Meredith is also a local artist and exhibits around Lexington. The reason she got involved with OTMAS is because she loves helping kids learn about art. Highlights of her job are teaching kids new skills and helping them understand that there is nothing they can’t do. Your one wish for the kids we serve: Meredith’s wish for the kids that they apply these skills to their futures. Brief bio: Callie is a Kentucky native who graduated from Berea College and received her bachelor’s degree in sculpture. Her passion is “junk art,” also known as found object art, as well as working in her garden. ​Why you are involved: I joined OTMAS in late August of 2018 through the AmeriCorps VISTA program, Volunteer In Service To America, because I was ready to do real work towards empowering my community. As a VISTA, I will help with capacity building and sustainability. Being an artist, I understand art as a healing process and view creativity as an outlet. This inspired me to join forces with On the Move Art Studio and I wanted to help them continue to carry out their mission. Your one wish for the kids we serve: My wish is for each child we serve to discover and get lost in the positive outlet of creation as well as see the world through a new perspective.